If you want to write a cover letter for Job application easily and fast, then you need to learn how to write an amazing cover letter to get you rids off disapproval. Today’s applicants are worried about writing a good cover letter since employees are no longer satisfied with the old methods or formats of cover letters. In this article, I am going to show you all on how to significantly write an amazing cover letter that can generally get you a job! 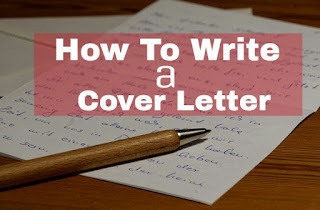 Cover letter is the most important thing while searching/applying for a job vacancy in any organization because it describe your capability, potentials and what you are best in doing. What am I trying to say here? The more work and present your cover letter, the higher possibility to get your job Application Approved. That is why most of the Applicants are always asking about what should be included in a cover letter content, formatting guides for a successful cover letter writing. But before we go ahead, let me give you the highlight of what a cover letter is. Cover letter is a document sent with your resume to provide additional information on your skills and experience. A cover letter typically provides a detailed information on why you are qualified for the job you are applying for. A cover letter should complement, not duplicate your resume. Its purpose is to interpret the data-oriented, factual resume and add a personal touch. A cover letter is often your earliest written contact with a potential employer, creating a critical first impression. • The application letter which responds to a known job opening. • The prospecting, unsolicited letter of enquiry which asks about possible positions. • The networking letter which requests information and assistance in your job search. Your cover letter should be designed specifically for each purpose outlined above as well as for each position you seek. Do not design a standardized letter and send it to every potential employer (you know what you do with junk mail!). • How did you learn of the position or company? What do you know about the company? • Why are you perfect for the position? What sets you apart from the crowd? • Who will contact who? • Request a meeting or personal interview. • Mention that you will contact them to schedule a personal meeting. • Explain how they can reach you. • Thank them for taking the time to consider your application. Take the time to customize your cover letter to fit the employer’s requirements. Before you start writing, review the criteria for the position and make a list of what the employer wants. This list might include specific areas of expertise, years of experience, technical knowledge, transferable skills and personality traits. Then, incorporate these items into your letter, demonstrating, by giving examples from a previous job perhaps, that you have the desired qualifications. Write the cover letter with the employer’s needs in mind, not your own. Don’t describe what you want, but explain what you can do for the employer. Don’t assume that the employer will read between the lines of your resume and dig out the relevant information. They won’t. To get their attention, you have to actively describe how you can meet their needs. State why you should be hired. Be assertive about your qualifications and assure the employer of your capabilities. The content of your cover letter should clearly explain to your employer of what you are capable of doing and how you will accomplish them, just as when writing persuasive paper topics. Keep your cover letter short and include it in the email message. Don’t send as an attachment unless the employer specifically requests one. Get straight to the point and write short, targeted letters. Each letter should be one page, or less. Each paragraph should contain three or four sentences, at most. Keep copies of all your cover letters, so you know what you sent to whom. Paragraph #1: State immediately the position you are pursuing and how you came to know of the opening [e.g. newspaper, giving date, website etc.]. If you have an alumnus, family or other contact in the organization, you can mention that here as well. Tell the employer briefly (one or two sentences) why you are interested in this position. Paragraph #2: Highlight the skills and experiences you have that would make you successful in the position. For example, if you are a new graduate with limited experience, talk about classes you have taken, activities you have been involved in, summer experiences you have had. You do not have to have directly related experience, but think about the skills you have gained from what you have done and how those could relate to the duties of the position you are applying for. [Make the links for the employer]. You do not want to repeat your resume to the employer in this paragraph, but this is the place to highlight relevant accomplishments that will make the reader want to learn more, and which in turn will lead them to your resume. The goal is to show the employer that you have confidence in your ability to succeed in the position. Paragraph #3: Demonstrate that you have done some research about this organization. Go to their website and talk to alumni or other contacts that may currently work for the organization. This research does not have to be extensive, but it shows that you have taken some time to think about this position and put some effort into this letter. This makes a very good impression on employers. It shows that this is not a standard letter, where only the address and contact name is changed for each position. Paragraph #4: State that you would welcome a personal interview to further discuss this opportunity. If you need to explain anything out of the ordinary on your resume, this is the place to do it. You might mention that if you do not hear anything from the potential employer in two to three weeks’ time, you will call to follow up this letter to see where they are in their process. Finish by thanking them for their attention and express a desire to meet them sometime in the near future. I know how it feels when you can't come up with an idea to write a Detailed but yet a simple cover letter for resume by yourself and that is why I put up this good cover letter examples to help you! Thanks for reading, feel free to comment if you have any question. Thanks for taking the time to read and leave your comments.